Community volunteers, leaders and nonprofit organizers of the City of San Jose are working hard every day to bring their community and residents toward a brighter future, telling us more of their journey to the present day and what their plans are for their community. After that moment, Mr. Srinivasan’s want to help his community was ignited, and, over a bit of time, he realized that the best place to start helping his community was by starting to help out in schools and school events. Mr. Srinivasan had a vision for his community from when he first started his current roles. “So the primary vision is to build a stronger community. The basic idea is that if everybody in the community succeeds, then the community thrives, and it kind of extrapolates, and becomes a wider range. So if each community succeeds, the city succeeds, and if the city succeeds, then the state succeeds, and so forth. So it starts at the very basic level. That’s where I thought it was the best place to start to make an impact … we want to make sure that all of the children, regardless of their background, are given the same opportunities, and there is equity in whatever the school rules and whatever the state is doing. That’s the main thing that we are focusing on: children’s advocacy.” Mr. Srinivasan has more planned for the future of his community, mainly focusing on educating parents and advocating for all school children. Within the school system, we have the charter school system of Summit Public Schools. Focusing on the community of Summit Rainier, we have a well-decorated, well-known city volunteer standing among us in the school’s office every morning. Before becoming a parent, Ms. Kobayashi went to college and learned more about her own cultural background, and she used as much of her knowledge as possible to make a suitable environment for her two children. “When I went to college, I majored in American Studies … So I studied history, literature and politics, and I focused on Japanese Americans. I did a lot of work with my family history and the pasts, so like, my grandmother’s immigration story and what she did, but also studied other immigrant groups. When I graduated from college, I worked for a senior center, so working with the elderly and the Japanese Americans, and then I had kids, so once they were born, my mind kind of switched gears and I became a stay-at-home mom. But then they were involved with Las Madres Playgroups, so I was involved with that, preschool, Girl Scouts, and things like that. It all builds upon each other. Then, even though Emily is in college, I still do stuff for her.” This was the beginning of her current role in the community of San Jose. Even in a smaller school environment there are roadblocks, which are, “Trying to use your skills so that they are not wasted, so being efficient or effective. There are lots of things that need to be done that nobody else wants to do, but sometimes you just need to find the right person to the job. Also, leveraging who and what I know to make it more effective to our community. So, involving other people as well,” she said. From the perspectives of the school and neighborhood community, to that of a home-maker and decorated nonprofit volunteer, Muneerah Lalani, with her degree in nonprofit management from San Jose State University, started her role in the community by volunteering at her daughter’s school (Noble Elementary School), and has been busy in her plans for bringing together all of the nonprofit organizations to work together for a better future. “I am very much involved in a lot of nonprofits. I started with the Noble Elementary PTA group, and I came across a lot of individuals who were very involved with community service. So you network with a lot of people and you get involved with a lot of local communities as well,” Ms. Lalani said. There are, of course, always roadblocks to every role and position in the community of San Jose. “The hardest part, sometimes, is when you’re reaching out to volunteers, and they probably do not have the same level of commitment that you require them to have, or sometimes they just sign up for some projects, and then they don’t show up. 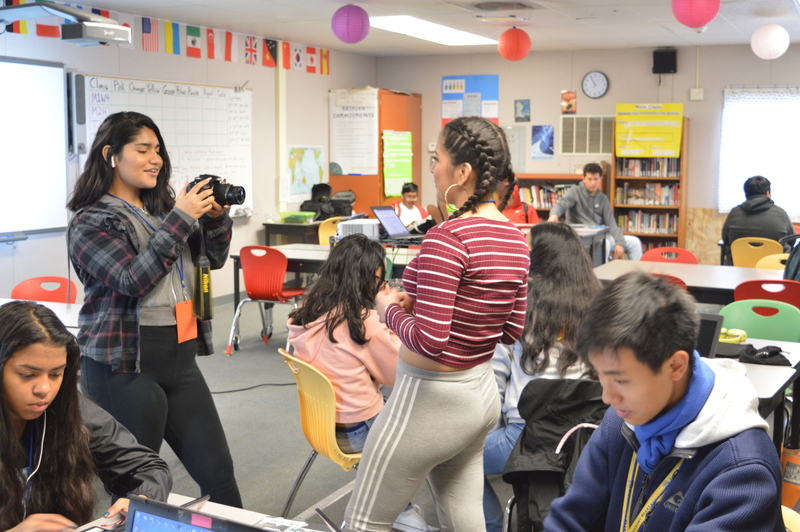 So I guess the motivation is not there, but we are trying [to get] more and more people motivated,” Ms. Lalani said. Ms. Lalani has spent countless hours in trying to not only reach out to everyday people, but she has reached out to many of city politicians to help the cause. Despite all of her hard work for her city, at the end of the day, she is a mother, and she feels pride in what she has done alongside satisfaction, and contentment. She has felt inspired from all of the people she’s worked with and has met. “I think the reason why I say I’m proud of it is because my daughter is very proud of me for being involved, but a lot of other people or other children who are not related to me, and have come and have said that they have become inspired to become more involved in the local community, so I think that’s a great step,” she said. From the local neighborhood community to city community, we find a leader who plays a big role in helping his district and plays a part in pulling the city together. San Jose City Councilman of District 7 Tam Nguyen has spent the last four years in office, serving this district with pride and love. “My first two priorities are to keep my district and city safe and clean, and then later on would be better traffic, better roads, and so forth … I serve the needs of the City of San Jose, especially the residents of District 7,” the councilman said. Councilman Nguyen spends the majority of his day at work at City Hall, and the remainder of his day in his district, helping out community centers, coming to check up on people in their homes, and helping to clean up his district in any way he can. On weekends, he would spend his time picking up trash, carrying his phone with him to answer any calls from residents that need his assistance. Anyone can reach him by cellphone or find him working in the field. “For the past three years or so, I clean up every weekend. I have many dumpster days, clean-up days, community events. I come to them to connect people to keep the community of District 7 safe and clean … All of my time is here with the community, listening to them, sharing with them, their difficulties, and I do whatever I can to make their life easier,” he said. Not only is the district as a whole important to Mr. Nguyen, the children in the school system also have his attention. He assigned and put together crosswalks for the children to be able to safely walk to school. He helps his community with different events, from lighting of the district Christmas trees, to the New Year’s Celebration, Lunar New Year’s celebrations, and larger gatherings within the district to bring people together and encourage people to make a difference. “Because I only come and go, we only have four to eight years in office, we go on with life, right? So let’s work together. The bottom-line is that the job is there, and there is a lot needed to be done, so let’s work together as a team, and do it in a constructive and respectful way together. That would be my, if you’d say, my ‘message’ to his community,” Mr. Nguyen said. Every person in the city community of San Jose plays a different role, and plays a different perspective. Though there are many problems that are similar and different with each position, there is one problem that is the same for each position. The need for volunteers and help from other residents in the city is always needed. One person can only make a small difference and encourage others; it takes everyone working together to make a difference in bringing the city and the sub communities toward a brighter and better future.